10.15-1.45 at Kennington Library. OX1 5PG. 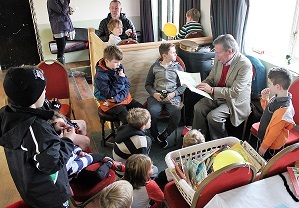 Family activities at the Kennington Literary Festival, with Korky Paul and his latest Winnie and Wilbur books. To celebrate the FCBG’s Golden Anniversary and OCBG’s Silver Anniversary, we held a special Gold and Silver Birthday Party for OxFedTed, at the Story Museum in Oxford on May 5th. We had several talks and readings from special guests, Neil Griffiths, the original creator of Story Sacks, and Children’s Poet, John Foster, and many other local authors and artists…. Oxford CBG held a day conference on Saturday 7th October at Oxford University Press. Joss Stirling and Tom Moorhouse talked about their work as well as Nicki Thornton, winner of The Times /Chicken House Children’s Fiction Competition, Bill Laar, educationalist and children’s books expert and enthusiast and members of the Oxford Children’s Dictionaries Team. MAY 16th : Author GILL LEWIS visited Botley Primary School. JULY 10th : Author GILLIAN CROSS and The Demon Headmaster Summer evening event. Oxford Children’s Book Group donated story sacks to the children’s hospital to mark World Book Day. The OCBG always marks World Book day in a special way. For the last three years, they have donated sets of story books to the Horton Hospital, Helen and Douglas House and the J.R. Children’s Hospital. A few months ago, OCBG was approached by the J.R. to make special Story Sacks for the Children’s Hospital. Story Sacks normally contain soft toys but the group needed to devise germ-minimising Story Sacks which could be used by children on the wards. OCBG made 20 Story Sacks to give to the Children’s Hospital, in honour of World Book day. The Story Sacks were officially launched on March 6th at 11am. One of the Story Sacks was donated by Neil Griffiths, who invented Story Sacks, for use in his Swindon school. Since then, the concept has grown and Story Sacks can now be purchased ready-made, and found in schools world-wide. Each sack costs at least £50, so by creating and donating 20 sacks, the OCBG saved the Children’s Hospital £1000! Being a small charity, the OCBG could not afford to purchase Story Sacks for the hospital, so instead they hunted for washable toys and props, and held workshops, in which they worked hard, sewing, gluing, and enjoying themselves. Everyone welcome and reduced rates for members. 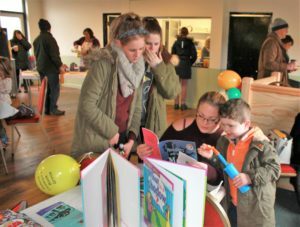 The Oxford Children’s Book Group (OCBG) is a county-wide group of people of all ages and backgrounds who are united in their desire to encourage children to love books and reading. OCBG is part of the Federation of Children’s Book Groups which was set up to promote interest in children’s literature for all ages, from pre-school to teenagers. Over the last 20 years, the group has organised a wide range of exciting events for our member schools and for families across the county. These include storytelling sessions in local libraries; Book Swaps; the Children’s Book Award testing and reviews where books are selected by young readers and not by adults; Creative Writing workshops; Author events; and Family Fun days, such as a Dads n’ Lads Rugby club event, and an Alice day at Binsey’s Treacle Well. Altogether there were members of three clubs playing matches on Sunday 27th November, with the Oxford Harlequins and Abingdon playing as well. Moira da Costa of the OCBG ran a book stall of mainly non-fiction books and their ‘resident’ storyteller, Bill Laar ran a short Rugby Quiz and read aloud some ‘back-to-front’ traditional tales, such as the ‘Three Little Wolves and the Big Bad Pig’ be Eugene Trevizas and a few ‘Revolting Rhymes’ by Roald Dahl. Harry, age 4, helped to blow up the OCBG balloons. His mother said she had been reading aloud to him every night since he was a baby, because she knew how important listening to stories can be. She is aware that stories help children develop their vocabulary and language skills. Oxford also celebrated the power of sstory as part of the Federation’s Jean Russell Storytelling Project. OXFORD CHILDREN’S BOOK GROUP STORYFEST: JASON AND THE ARGONAUTS SAIL INTO OXFORD WITH STORYTELLER ANNA CONOMOS! 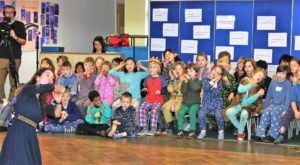 On Thursday 17th and Friday 18th November, the Oxford Children’s Book Group held an exciting Storyfest – a celebration of storytelling- with three local primary schools: St Ebbe’s, New Hinksey and St Aloysius. Each school enjoyed a half day of inspiring workshops with performance storyteller Anna Conomos, an award-winning storyteller who grew up here in Oxford. 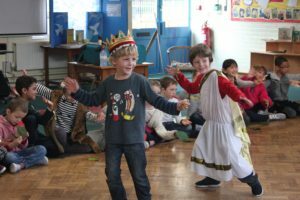 Then, on the Friday afternoon, 180 children from the three schools came together for the first time to briefly rehearse and then perform the story of ‘Jason and the Argonauts’. Individual children played specific roles, from Hercules to Athena, but they also acted together, becoming in turn a whole galley crew, a deep, dark forest or the many-headed, fire-breathing monster that guarded the Golden Fleece. For the finale, the audience was made up of more children from St Ebbe’s plus guests from the Story Museum, the National Federation of Children’s Book Groups and the Ragdoll Foundation which generously funded the Jean Russell Storytelling project. Julia Miller, project coordinator, said that 19 schools and nearly 2000 children had benefited from the project. They had all enjoyed working with- and learning from- Anna’s lively approach to storytelling. The OCBG Storyfest was the sixth and final event in the project. 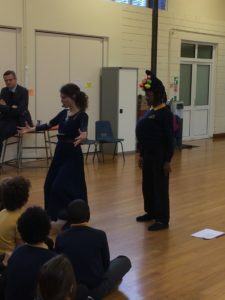 The OCBG was delighted that Anna Conomos had been chosen as the Jean Russell Storyteller because she used her many talents to bring into reality their vision to unite children from different schools in the shared experience of storytelling. In Oxford, a total of six classes and their teachers were involved but, ultimately, all the teachers in each school will benefit from the Storyfest because the Ragdoll Foundation has presented them with Anna’s DVD and her very own storytelling training course. 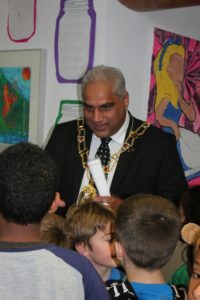 The Lord Mayor of Oxford, Atlaf Khan, who attended the finale at St Ebbe’s school, remarked how well Anna engaged the children in the story. He was most impressed by the children’s enthusiasm and how they remembered all the actions and songs and rhymes. Stories reach our innermost hearts; they help us to confront our deepest fears; they facilitate our understanding of our own stories and of those of those around us. Stories bind us together: adults, children, cultures. They provide escapism and they help us to cope with difficulties in life. The Jean Russell Storyteller Project focuses on bringing the joy of stories to children in hospital, in schools, to young carers and to children in deprived communities across the UK. Jean Russell was a member of the Federation of Children’s Book Groups in its early days, working closely with founder, Anne Wood. She was always passionate about stories, as they had helped her when she was ill in hospital as a child. OCBG will hold a very special two-day STORYFEST on the 17th and 18th November. We are delighted to have been awarded a grant by the Ragdoll Foundation to run our Storyfest and to work with Anna Conomos, who is an internationally renowned storyteller. Anna will be coming to Oxford in November to work with children from three Oxford schools: St Ebbe’s, East Oxford First and New Hinksey. Naturally, Anna will entertain the children in her own lovely and inimitable way, by telling and sharing stories but she will also help the children and their teachers to develop their own storytelling skills. Oxford celebrated National Share-A-Story-Month’s “Stories in Unusual Places” at The Painted Rooms, 3, Cornmarket, Oxford on Saturday 14th May from 10.30 to 1pm. Visit our National Share-A-Story-Month page to read all about it. Oxford Children’s Book Group organized two Dragon events for NSSM during May. *a storytelling session at Kennington Library with Deborah Cooper on Wed 27th May during half term. *Dragon Frolics on Saturday 30th May, A Dragon morning for families! John Radcliffe Hospital: Oxford Play specialist Erica Watson, is given over £100 worth of new books by Oxford Children’s Book Group committee members, Erica Davis, Jackie Holderness and Moira da Costa to celebrate World Book Day. Each book has an Ex Libris book plate with the new OCBG logo designed by illustrator Terry Milne. Erica and her team were delighted with the gift. Click here to download Oxford CBG’s Winter Newsletter 2013. What an exciting action-packed day it was! How did we manage to pack it all in? We took the theme of ways of getting children reading by less conventional means and we certainly learned a lot. Beginning with Professor Victor Watson, formerly of Homerton College Cambridge, who talked to us about his fascination with series fiction and the reasons it helps children to feel safe, where each new book is like entering ‘a room full of friends’, we then enjoyed a thought provoking talk about Project X and the role of reading schemes in the lives of 21st century children from Andrea Quincey of OUP. After coffee we enjoyed a taste of the ways that author Tracey Corderoy engages children on school and festival visits with costumes, craft, animals and LOTS of imagination, and heard about The Phoenix Comic (a real comic not a TV tie-in magazine) and how it engages children in the pleasure of reading. After an excellent lunch we had more treats in store, firstly Vineeta Gupta talking about creating the Oxford Children’s Dictionaries from the children’s corpus and then the wonderful Andy Mulligan talking about Dangerous Books and the role edgy fiction can play in drawing in the reluctant older readers. Finally a special storytime for us all with the lovely Bill Laar, ably demonstrating that enthusiasm and storytelling are important in bringing children and books together. We’d like to thank all of our speakers and the publishers who supported the day, especially Oxford University Press for allowing us to use their beautiful venue, and also Mostly Books of Abingdon for running a very popular bookshop for us. Click here to download Oxford CBG’s Spring Newsletter 2013. Oxford Children’s Book Group were delighted to hold their 20th Birthday Party in October 2012. The very appropriate location was The Story Museum in Oxford which was decorated with festive OCBG bunting, posters and photographs. Our guests included authors and illustrators we have worked with over the years, many of our members and other amazing people who have supported the Oxford Children’s Book Group. We all enjoyed looking at the scrap books showing 20 years of activities and a display of books written and illustrated by many wonderful authors and illustrators who we are proud to say have become our friends. Many who could not attend sent us special messages of congratulations. One of our founder members, poet John Foster, entertained us all with storytelling and poetry, our Chair Moira da Costa gave a speech of course, as did Helen Taylor who has been a member since she was a little girl. Ted Dewan gave tours of Mr Rochester’s fantastical StoryLoom and Bill Laar sent us on our way with inspirational words about the importance of children’s books – but not before we cut the wonderful cake, decorated with the birthday year logo designed by two young members. We are looking forward to the next 20 years! Click on any of the thumbnails to see larger pictures of Oxford CBG’s 20th birthday event.